Gourmet Gadgetry The next generation of cookware, gourmet gadgets and chocolate fountains for the home. For use with the Gourmet Gadgetry Cupcake & Muffin Maker, Retro 3 in 1 Sweet Snack Maker and Retro Stick Snack Maker. 1. Plug your machine into the wall and allow to pre-heat while you make the mixture. 2. Put the butter and dark chocolate into a bowl and melt in the microwave, stirring continuously. Once melted remove from the microwave and leave to cool to room temperature. 3. Break 3 large eggs in a bowl and mix in the golden caster sugar with an electric whisk until it is thick and creamy. 4. Pour the dark chocolate and butter mix into the egg mix and fold with a spatula. 5. Sieve your plain flour and cocoa powder over the mixture gradually while folding the mix. Continue folding until the mix is gungy. 6. Now pour your white & milk chocolate chips over the mixture and gently mix until they are evenly dotted throughout the mixture. 7. Open your machine and spray with a little spray oil. Spoon the mixture into the compartments then close and allow to back for 8 minutes before checking to see if they are finished. 8. 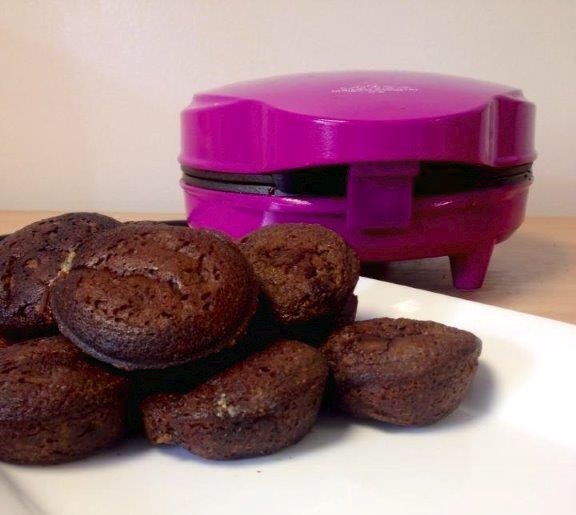 Remove the brownies from the machine and allow to cool for a few minutes before serving. © 2019 Gourmet Gadgetry. All Rights Reserved.